Often some of the best learning tools can be the stories and experiences of our peers. What better way to set your own path than by informing your steps with the challenges and successes of those who have treaded similar roads. 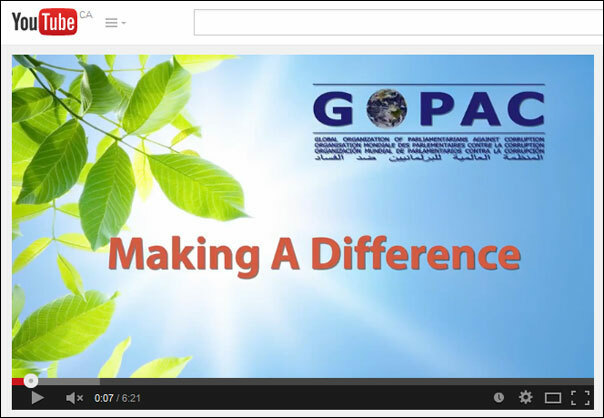 GOPAC is working on a series of videos called Making a Difference. Each video shares the story of one of our members and looks at their experiences in the fight again corruption and as part of GOPAC. They represent a cross-section of our membership and represent our regions and languages. Our first video was created by the Honourable Ali Ashal, a member from our chapter in Yemen. He has been involved in GOPAC since 2005 and has been a representative in Yemenâ€™s House of Representatives since 2000. We encourage you to share this video with your contacts. In the lead up to the G20 meetings in Brisbane, Australia in November, GOPAC UK is calling for the G20 to reduce the costs of cross-border trade, tackle illicit financial flows and increase financial transparency which will be vital to supporting developing countries to mobilise domestic resources and lift themselves out of poverty. In a letter addressed to the G20, our members in the UK are asking member countries to take make fighting corruption a priority. They are calling for an end to anonymous shell companies by making beneficial ownership information of companies, trusts and similar legal structures publicly available in their countries and jurisdictions, including overseas territories and dependencies. They are also encouraging member countries to sign up to the Extractive Industries Transparency Initiative and work towards implementing a common global mandatory reporting standard that requires companies extracting natural resources to publicly disclose financial information on their operations in every country in which they have a presence. We would like to encourage all GOPAC national chapters to follow GOPAC UKâ€™s lead by making similar calls to G20 member countries. Together we can make fighting corruption a lead issue on the agenda. What is your take on Parliamentary Immunity? GOPAC Sri Lanka parliamentarians recently met in the deputy Speaker's office to progress their 2014-15 activities plan. The chapter committed to setting up an office where citizens could report corruption and enable social media reporting to ensure parliamentarians were more aware of corruption hotspots. GOPAC Sri Lanka Secretary, met with John Hyde, GOPAC Board Member, while in Siem Reap, Cambodia in October. They discussed ways to ensure a strong representation of Sri Lankan MPs committed to anti-corruption attending next year's GOPAC Global Conference in Indonesia. GOPAC Board Member, John Hyde, was in Siem Reap, Cambodia this October and took the opportunity to share GOPACâ€™s mandate and work with peers. Mr Hyde met with the Hon Peou Savoeun, a parliamentarian in the Parliament of Cambodia and member of the parliamentâ€™s Standing Committee on Anti-Corruption. The two discusses the potential of developing a GOPAC chapter in Cambodia. GOPAC Serbia welcomed new parliamentarians into their membership this past month. In addition, they welcomed Olgica Batic as the new Chair of their Executive Committee. The Deputy Chair position is still pending. GOPAC was once again invited to host a panel session at the International Monetary Fund and World Bank Fund Annual Meetings in October as part of the meetingsâ€™ Civil Society Program. The packed room included parliamentarians, representatives from international organizations and civil society actors. The session was in line with our global project on grand corruption which focuses on bringing perpetrators of grand corruption to justice. It opened up a discussion to uncover perspectives on coordinated efforts to fight corruption and eliminate grand corruption. Through the event we sought to understand what the international community can do to tackle grand corruption and how we can build momentum on this issue together. GOPAC was represented on the panel by our Executive Director, Akaash Maharaj. He was joined by Zorka Milin, a Legal Advisor at Global Witness, and Christiaan Poortman, the Chair of the Construction Sector Transparency Initiative at Transparency International USA. GOPAC member Donya Aziz moderated the discussion. The meeting built enthusiasm for the issue amongst the international community and showed that it is one that many feel passionate about. It also helped to further solidify GOPACâ€™s role as a leader in the fight against grand corruption. We were also encouraged by other organizations who pledged their support for work on grand corruption under GOPACâ€™s leadership. We, the under-signed, believe transparent, accountable and inclusive institutions are vital if we are to end poverty and protect the planet. We are convinced that a specific goal addressing this urgent call is an essential component of the Post-2015 Development Framework. The reasons are overwhelming. Millions of citizens around the world, particularly youth, are demanding more open and accountable governance. In a public opinion poll, over four million people identified â€œhonest and responsive governmentâ€ as one of their top four development priorities. The Post-2015 Development Framework must respond to this overwhelming call by enabling people, especially those experiencing poverty and marginalisation, to participate in governance at all levels. In order to eradicate poverty and ensure sustainable development, governments, companies and civil society must collaborate to strengthen transparency, participation and accountability. We should promote open societies, a free media and freedom of expression, association and peaceful assembly, legal empowerment and the rule of law. We should also join forces to implement anti-corruption measures that enable effective and inclusive economic, social and political institutions at all levels of society. Corruption thrives in every corner of the world and in countries of every income level. Developed countries have a particular responsibility to ensure there is no safe-haven for corruption. Given the strong correlation between the rate of bribery and several key development indicators, governance and anti-corruption must be top priorities when new development goals and targets are set in September 2015. This has already been recognised. In 2013, the United Nations High-Level Panel on the Post-2015 Development Agenda recommended a dedicated goal on good governance. In 2014, the Open Working Group on Sustainable Development Goals called for a goal on effective, accountable and inclusive institutions. We encourage the Secretary-General and members of the UN General Assembly to heed these calls. In 2030, we want a world where transparent, accountable, effective and inclusive institutions help eradicate poverty and protect our planet for future generations. Now more than ever we must act to enshrine good governance within the sustainable development goals. Please join us. Click here to view document with signatories. Parliamentary ethics as a tool to fight corruption has long been a topic that GOPAC and our members have promoted and supported. In October, GOPAC released its latest position paper Preventing a Tragedy of the Commons to build on existing work on the topic. In it, GOPAC focuses on discussing the issue of conflicts of interests and how they can affect the work of parliamentarians. The paper explores how parliamentarians in their work of serving a greater good are in essence actual â€œcommon goodsâ€ and that the legislature could succumb to the very same abuse that other â€œgoodsâ€, e.g. natural resources or common land, could be made to suffer. That is, the â€œtragedy of the commonsâ€ or abuse of something held in common interest. Assuring that an ethics commissioner, or similar independent office, is sufficiently supported in its work of maintaining integrity in parliament. We encourage all our members to review this important paper and to share it with colleagues and partners. Parliamentarians need to build and safeguard strong and clear rules on conflicts of interest in parliamentary ethics and conduct regimes. This goes to the heart of advancing the integrity of democratic institutions and protecting the greater good, the common good.